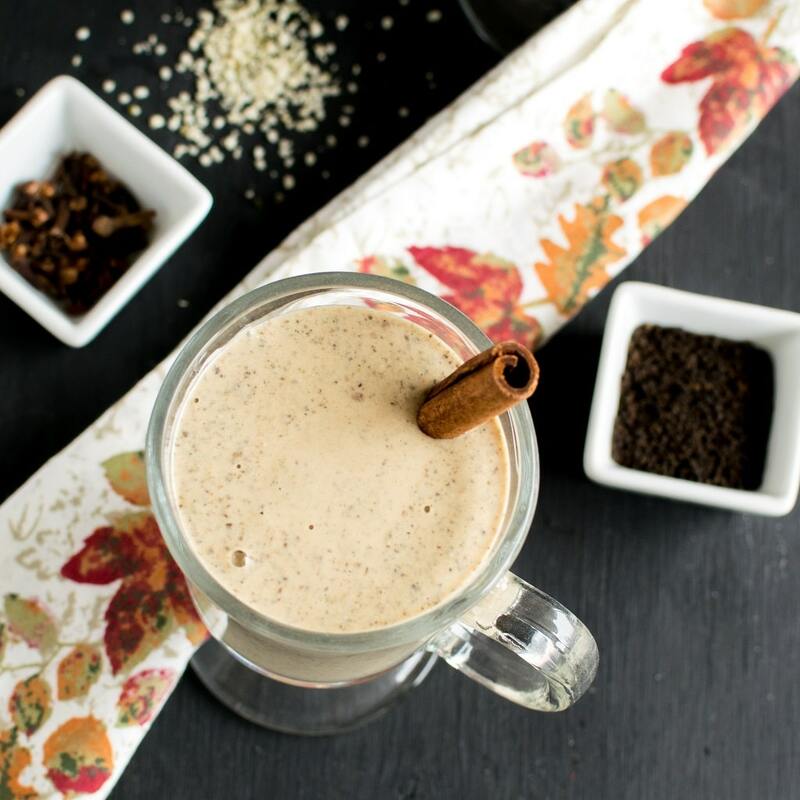 Masala Chai Protein Smoothie is packed with aromatic Indian Chai spices along with natural protein. In the New Year I am starting a high protein and low sugar plus low carb diet. While I try out my new diet I am debating about increasing the good fats. It definitely helps in losing weight. However, I am still working on my diet plan and hopefully I should see a new me soon. In the meanwhile I came up with this Masala Chai Protein Smoothie. Masala chai is regular in my house. Since years every morning the first thing I want is masala chai. The aroma of the sweet spices and the loose tea boiled together in water just wakes up me up. It rejuvenates me in the morning and brings a smile on my face. It calms me down in many respects as well. Masala Chai has become very popular all over the world and I am proud to say that it originated in India. In India almost every households enjoy masala chia in the morning since generations. This time, I decided to combine this age old masala chia recipe with a protein smoothie. This way I derive two benefits. While I enjoy the flavors of vegan masala chai I get my required protein after a workout for muscle recovery. I must admit my husband loved this smoothie after his 5 miles run. He couldn’t stop devouring the rich, thick and creamy texture of this smoothie. Masala Chai Protein Smoothie also suffices our protein requirement. Masala chai is made in many ways but I chose to use easily available ingredients so as to make it faster. Therefore, I used the powdered form all the spices except for cloves. 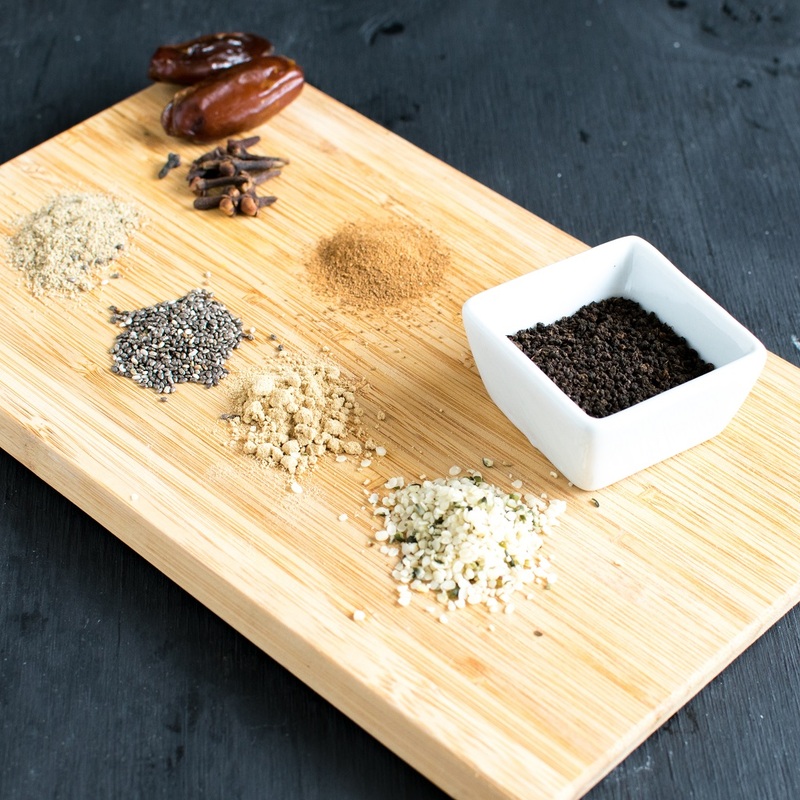 If you desire, you may use whole spices in masala chai along with water and loose tea. I prefer convenient healthy recipes so I get no excuses to stay fit and healthy. Also when I make quick and easy healthy recipes I never derail from healthy eating. It’s my way to eat healthy and nutritious. I am sure everyone has their own way to stick to healthy eating. I can assure you that this Masala Chai Protein Smoothie is a winner and that you will love its lip smacking taste. It’s a must try! 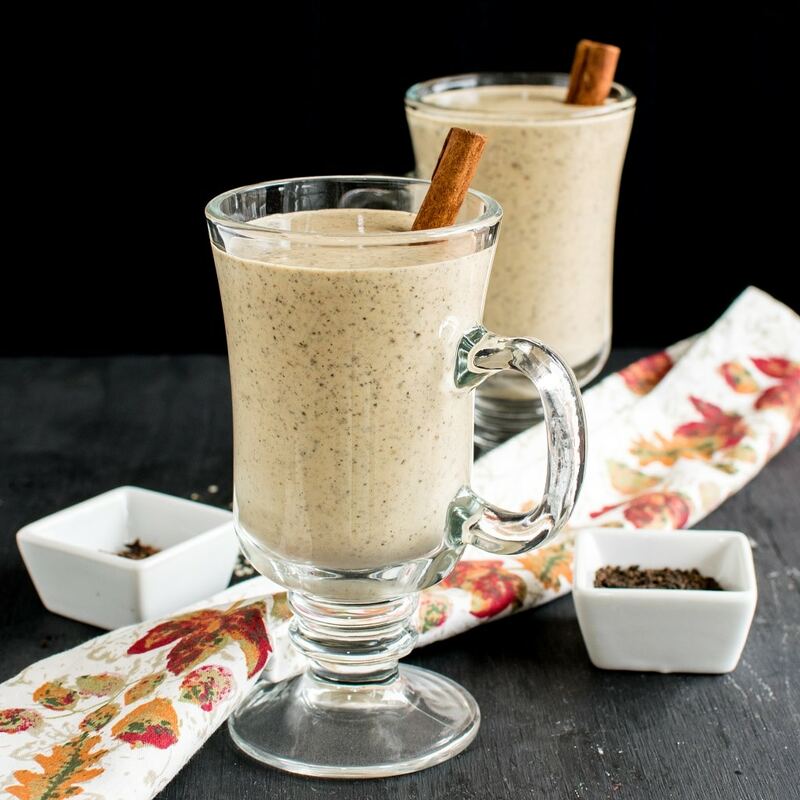 Masala Chai Protein Smoothie is packed with aromatic Indian Chai spices along with natural protein. it's an easy and lip smacking after workout replenishment. In your sauce pan boil water. At the first boil add 2 tsp loose tea. Next add all the spices of masala chai. Boil it for only 30 seconds (do not overdo this step). Turn off the flame and strain masala chai in a glass. Let it cool slightly. Thereafter, in a blender combine all the smoothie ingredients along with strained masala chai. Afterwards blend it smooth and serve immediately. This recipe is not a very strong flavored masala chai. If you like strong flavors of chai then add 4 tsp loose tea instead of 2 tsp loose tea. This looks really good. I love a good smoothie. I would love to try this. I love all of the flavors in this. This will be great for breakfast! Chai with a magical twist 😍soooo new to me ! !